Celebratory lunch - Go Fit Girl! | Go Fit Girl! I had said once I hit goal weight I wanted a McDonald’s cheeseburger. 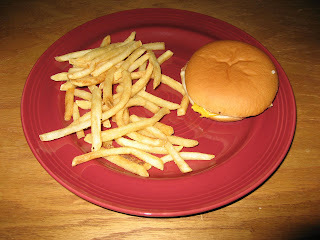 Even before I started WW I rarely ever ate fast food–I find it rather disgusting. But once in awhile I crave a McDonald’s cheeseburger. So yesterday afternoon I picked this up. Man it was good and worth the many points! And for those who are wondering. It fit in with my points. I didn’t go off “my diet” or what I like to call eating healthy or my lifestyle change.